The TACT Bivvy® is a powerful survival tool that can save your life, even in below freezing conditions. However, to get the most out of your TACT Bivvy®, you need to use it properly. Even though the TACT Bivvy® is simple to use, there are some tips you should follow to use it to its full potential. 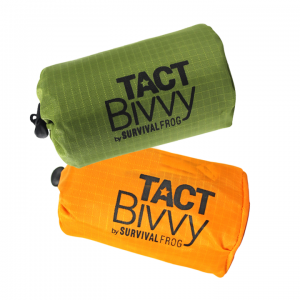 How is the TACT Bivvy® Different from a Sleeping Bag? The TACT Bivvy® is not a typical sleeping bag. It’s a special emergency-only sleeping bag designed specifically to keep you alive. Everything about the TACT Bivvy® is built for survival over comfort. You might be shocked by how thin the TACT Bivvy® is when you first see it and wonder how it could possibly keep you warm in freezing conditions. That’s because it’s made with HeatEcho® technology, an ultra-thin reflective polyester film. This special film reflects 90% of your own body heat back at you, which will save you in below freezing conditions where hypothermia is a very real threat. The bright orange color of the TACT Bivvy® makes you easy to spot by rescuers who are searching for you. Our green colored Tact Bivvy® allows you to blend into most green surroundings. Using the TACT Bivvy® is easy. First, you’ll need to pull it out of the carrying bag and then spread the bag out on the area where you want to sleep. Next, open the TACT Bivvy® and slide inside, being careful not to be too rough on it with your shoes. Tighten the opening where you slid in to prevent air from escaping, and you’re all set. For best results, you should be fully clothed when inside the TACT Bivvy®. You can also use the TACT Bivvy® in combination with another sleeping bag. Simply stuff your other sleeping bag inside the TACT Bivvy®. Using the TACT Bivvy® like this can add another 15-20 degrees of warmth! You might start to sweat after being in the TACT Bivvy® for a while. This is a sign that it’s actually working a bit too well. Open the TACT Bivvy® to let some of the hot air and moisture out. If the condensation is excessive, use a towel to stay dry. The TACT Bivvy® won’t be as comfortable as a typical sleeping bag. That’s because it is purely a survival tool, not a camping accessory. For that reason, you shouldn’t use the TACT Bivvy® in a non-emergency situation. It’s perfectly reasonable for you to test out how it works, but just understand that it’s not meant to be a fluffy, comfortable everyday sleeping bag. If you live in a warm weather climate, you’ll want to avoid using the TACT Bivvy® unless it’s absolutely necessary. The same heat reflecting film that keeps you warm in freezing weather will make you unbearably hot and even overheat if used in warmer weather. Heatstroke can be equally life-threatening. The TACT Bivvy® is durable enough to be reused repeatedly, however, you’ll need to take care of it to keep it in good condition. The material the TACT Bivvy® is made of is designed to stretch and be waterproof, windproof, and rip resistant, but you should still handle it with care. Be careful when getting into and out of the bag, as your shoes could potentially puncture the lining and cause the TACT Bivvy® to lose some of its effectiveness. Also, be careful of rocky ground that could puncture the TACT Bivvy®. Try to lay the Bivvy on smooth ground. This entry was posted in Cold Weather Survival, Emergency Preparedness and tagged bivvy, cold weather, freezing, hypothermia, instructions, manual, sleeping bags, tact bivvy, user guide on December 26, 2017 by David Adams.